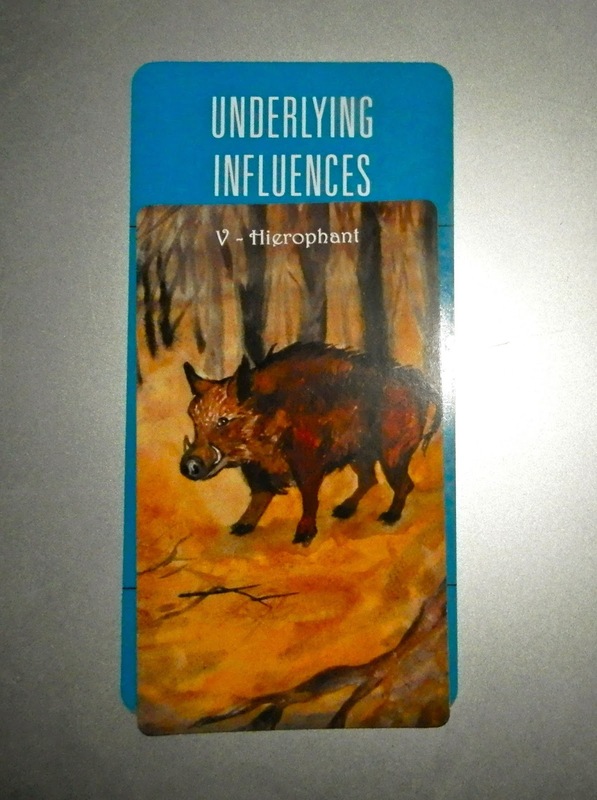 Today's Draw: Hierophant from the Badger's Forest Tarot in the Underlying Influences position from the Deck of 1000 Spreads. Do you recognize the influence of a higher power in your life? How do you receive guidance...in whispers or bangs? How deeply do you think that influence goes in guiding your everyday life? Traditionally, the Hierophant in the tarot was called the Pope. And he was the dude who preached the church's version of God, as the church wanted it preached. So his own personal relationship with God, if it veered from his religious teachings, were not brought forth. In that sense, I see this version of the Hierophant as being about religion and dogma and not about spirituality (which I define as one's personal knowledge of God). But that's not how I see the Hierophant. The word comes from ancient Greek and talks about someone who interprets the great mysteries of life. So while he still might be a priest, the difference is that he teaches his interpretation and not the interpretation of an organized body, such as the Catholic Church. While it's just a difference in details, it means a world of difference in the way I see the card. His own wisdom and free thought comes into play. And "interpreting mysteries" is a more accurate way of presenting information about God than "mandating beliefs", which is what I feel organized religion does. When it's just an interpretation of a mystery, then you're allowing that it's "your answer" and not "THE answer". 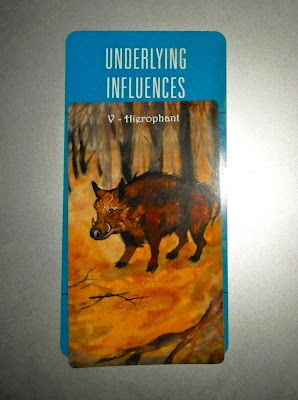 Before I veer off into a rant about religious freedom and how the world has gone way off track when it comes to everyone thinking their way is the ONLY way, let's consider the Hierophant in the position of Underlying Influences. When I first saw these two cards together, I thought about "the invisible hand that guides us". Which is a mystery in and of itself. Among those who believe in a higher power, I'd guess most believe in the notion of interaction with this higher power. I believe each of us is surrounded by signs, omens, winks and nudges that could be considered "an invisible hand guiding us" toward where we need to be. We all have stories about odd coincidences and intuitions that served to protect and/or guide us. Those little whispers pale in comparison to bigger ones, like the travel snafu that caused Seth McFarlane to miss his plane on 9/11—the same plane Mark Wahlberg was supposed to be on—saving both of their lives. We're all familiar with the guidance that comes in both whispers and booms, but consider the guidance that's so silent as to be "invisible". Like when something spontaneously makes you hold your tongue, rather than your spill your guts, as usual. Or when you're grocery shopping and throw something odd into your cart without really thinking. I often wonder, really how much guidance are we given? And who is giving it? Is it a higher being or just our higher selves? And is there even a difference between the two? Personally I don't think there's a second of our lives that is lived without "the guiding hand" near. We always have the option to choose differently. I don't believe everything is laid before us and we're just following a script. But I do think the more we listen and live in trust of the higher power, the more we dance and sway to its guidance. Which is why I think so much of it goes unnoticed. The guide only gets loud when it needs to. What do you think about all of this? What might you have done automatically today that, when thinking back on it, showed some sort of higher wisdom than what you're used to leveraging on your own? For me it was holding my tongue...haha. How deeply do you think the underlying influence of the higher power goes? Strangely, I was going to comment that my radar wasn't turned on today, as I managed to sit in the urine left behind by an (incontinent) old man beside me on the bus - yuck! So, was one more important, or was I just not listening for the other? Maybe both were divinely inspired. Maybe sitting in urine cued you to be more aware of your surroundings and so that's why you noticed the teacher. Or maybe someone on the way to a job interview would have sat in that urine had you not. Who knows? It's possible you weren't listening for the urine thing. But it's also possible you were and that grossness served a purpose you're not consciously aware of. As I sat down to read this, I saw in my mind's eye a great cosmic umbilical cord...haha Separate entities, but connected by something that gives us life force...something that fuels us. Connected but not fully conjoined. Thanks for this talk. I'm not sure this is answered yet for me, but plenty to think about. I do think most things have meaning. But I also think some things are random....or are meant to have meaning for someone else...you know, like we're being used as a bit player in someone else's drama or lesson.